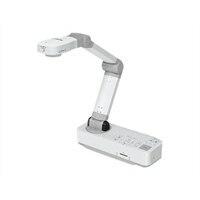 Epson DC-13 Document Camera - color - 2 MP - 1080p - audio - VGA, HDMI - USB - AVI, MOV - DC 12 VAdd new life to any lesson with the high-performance Epson DC-13 document camera. This portable performer makes it easy to capture and display books and experiments with clarity, thanks to a large imaging sensor and 16x digital zoom. Hi-def lessons are simple, with HDMI digital connectivity and HD 1080p resolution. Share magnified images with the microscope adapter. Or, record audio with video using the built-in microphone. At 30 fps, video playback is seamless. And, there are convenient Freeze and Capture buttons. You can even save lessons on an SD card or computer. Add new life to any lesson with the high-performance Epson DC-13 document camera. This portable performer makes it easy to capture and display books and experiments with clarity, thanks to a large imaging sensor and 16x digital zoom. Hi-def lessons are simple, with HDMI digital connectivity and HD 1080p resolution. Share magnified images with the microscope adapter. Or, record audio with video using the built-in microphone. At 30 fps, video playback is seamless. And, there are convenient Freeze and Capture buttons. You can even save lessons on an SD card or computer.